Summer: Visit a Neighborhood Street Festival | What's Up in Chicago This Weekend? Chicago may be harsh, but the city shines in the summertime. Ample greenspaces, parks, and waterside activities make for an active summer. If you live in the city, you likely look forward to the summer street and neighborhood block parties. More than 400 neighborhood festivals take place each year in almost every neighborhood, celebrating the area’s history, culture, and food. 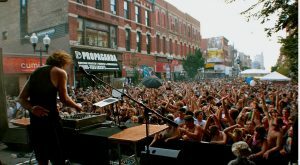 If you are travelling to Chicago in the summer, be sure to check out Choose Chicago’s outdoor festival and event guide—visiting neighborhood festivals is the best way to understand the city. A brief list of fan favorites includes: Do Division Street Festival and Sidewalk Sale, 57th Street Art Fair, Ribfest Chicago, Chicago Blues Festival, PRIDE Parade, Lincoln Park Greek Fest, Andersonville Midsommarfest, Ravenswood on Tap, Chicago Summerdance, Grant Park Music Festival, West Fest, Taste of River North, Wicker Park Fest, Randolph Street Market Festival, Fiesta Del Sol, Taste of Lincoln Avenue, Glenwood Avenue Arts Fest, Edge Fest, Jeff Fest, Chicago Jazz Festival, Clark After Dark, Pilsen Fest, and Festa Italiana. Wicker Park Fest pulls out some major bands. I really can’t believe it’s just a “suggested donation”–Against Me! showed up this year!